Lithuanian lands were united under MINDAUGAS in 1236; over the next century, through alliances and conquest, Lithuania extended its territory to include most of present-day Belarus and Ukraine. By the end of the 14th century Lithuania was the largest state in Europe. An alliance with Poland in 1386 led the two countries into a union through the person of a common ruler. In 1569, Lithuania and Poland formally united into a single dual state, the Polish-Lithuanian Commonwealth. This entity survived until 1795, when its remnants were partitioned by surrounding countries. Lithuania regained its independence following World War I but was annexed by the USSR in 1940 - an action never recognized by the US and many other countries. On 11 March 1990, Lithuania became the first of the Soviet republics to declare its independence, but Moscow did not recognize this proclamation until September of 1991 (following the abortive coup in Moscow). The last Russian troops withdrew in 1993. Lithuania subsequently restructured its economy for integration into Western European institutions; it joined both NATO and the EU in the spring of 2004. 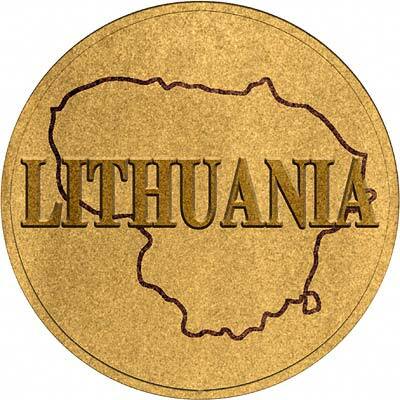 For silver and base metal coins of the Lithuania, please look at our original Chard Coins website. We make an active market in almost all world coins, gold or otherwise, including Lithuanian gold coins. If you have any of these coins to sell, please contact us, or post them to us for appraisal and offer.